Pupils will study the history of the local area employing the historical enquiry skills used by archaeologists. Pupils will discover how fragments of history can help build up a picture of the past. 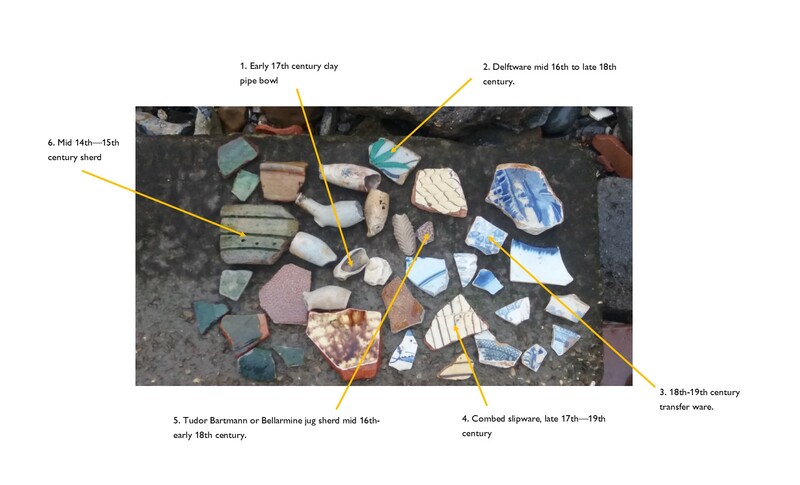 As well as the bones, oyster shells, mediaeval building materials etc that can regularly be found on the Thames foreshore there is a wealth of information to be gleaned from the pottery fragments (sherds). See below to learn more about some common finds. On the riverside pupils will develop an understanding of what the Thames is like today and gain knowledge of river geography. Fieldwork on the foreshore involves collecting and identifying historical artefacts as evidence of river settlement. This session will enable pupils to gain an understanding and awareness of the past and compare it to the present day. Indoor activities will enable pupils to learn how to distinguish between different materials and identify and date artefacts using specially designed sorting boards. Pupils will investigate how artefacts found around the Thames help us to build a picture of London’s history. By doing this they will gain a chronological knowledge from pre-history to present day. Museum of London, Museum of London Docklands, Greenwich, Brunel Museum, Southwark, Fulham Palace. Full day programme at all sites (except Southwark). Half day programmes at all sites (except Fulham Palace and Brunel Museum).